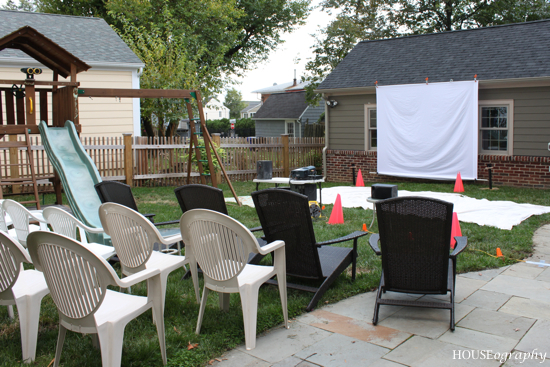 We threw a neighborhood movie night in our backyard on Saturday night. Yes, outside. Yes, it was soooo much fun. The weather was dry and cool - just like fall should be. 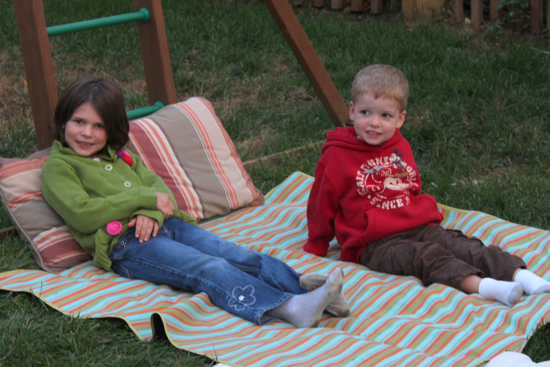 Everyone bundled up in their blankets and sleeping bags to enjoy the evening. I may have had more fun than the kids!! Honestly, it was probably one of the easier parties we have ever thrown in terms of food but the technical set up was the hardest part the first time around. Next time (and there will be a next time), it will be super easy because we'll know what to do. Here's the set-up a few hours before showtime. We borrowed a projector from my office which hails from an era when you had to bring your own projector for presentations. Laptops also weighed 10 lbs so fortunately those days are gone and fortunately my office had one gathering dust in a storage room. I think you can rent these from some office supplies stores or you can buy your own for less than $400. It is similar to this but much, much older. It still worked well. We hooked it up to an old table top stereo Handy Hubby uses in his workshop and added an extra set of speakers and a subwoofer compliments of one of generous neighbors. 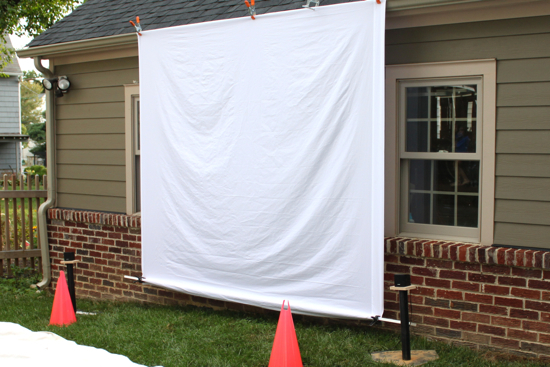 The screen was a queen size sheet that we hung from the garage gutter with some clamps. Handy Hubby clamped a lightweight piece of wood across the bottom and then steamed the sheet to take out more of the wrinkles (after this picture was taken - it was too dark by then!). We used plastic toy cones to warn people about the wires. The speakers above are sitting on Little League T's with a homemade speaker stand attachment compliments of Handy Hubby! 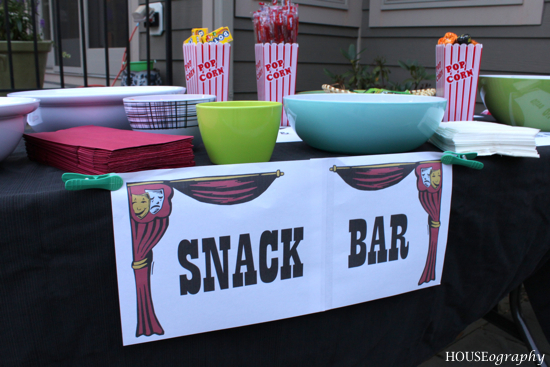 We set up a movie theater style snack bar complete with four types of popcorn from Trader Joe's and array of movie theater candy - M&Ms, Twizzlers, Dots, Reese's Peanut Butter Cups, and Junior Mints (my personal fav). In a bid to the season, I added some candy corn mix in a bowl. Much to Handy Hubby's chagrin I made a late attempt to add signage. 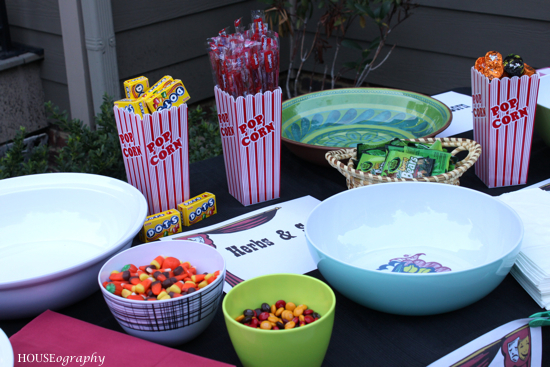 I think he was hoping for a sign free party :) Here is the party table before I poured the popcorn in the bowls. I was worried that birds would try to eat it before everyone arrived! I found these popcorn containers at a yard sale last week - perfect timing! I bought four for a dollar. They added the perfect flare for the table. The kids settled themselves in to watch a double feature. 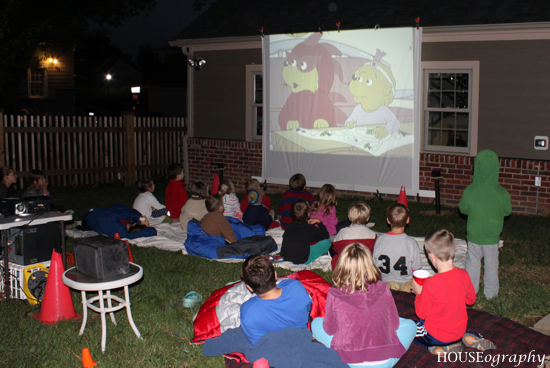 We started with the Berenstein Bears Trick or Treat at 7:15 and then "Big" with Tom Hanks at about 7:40 when it was really dark. Some families with very young kids went home after the first flick, but many remained through most of Big. Next time I think we'll show Shrek, or something along those lines. Best part for the parents may have been that beer was readily available... and of course the piano playing scene in FAO Schwartz! 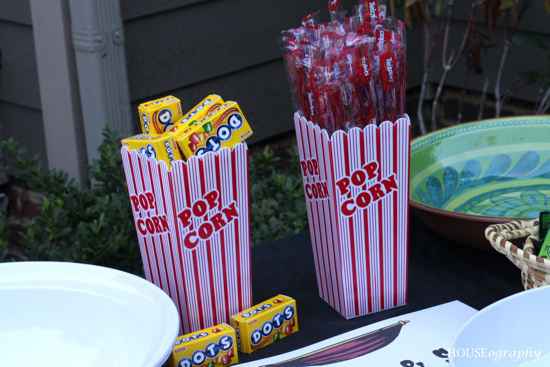 The kids had a blast and every last piece of popcorn and candy was devoured!! Probably one of the best parties we have ever thrown - probably because I was able to fully enjoy it. The only thing I did during the movie was refill the popcorn bowls a few times! We love our neighborhood and we are so happy to be able to throw fun little parties like this which make everyone want to never leave! !